Both generic and name brand all-purpose cleaners are a great way for getting the best cleaning results possible. But because traditional cleaners that are filled with harsh chemicals can potentially be harmful to the environment and to your body, finding an ecological alternative is the key. Green cleaning and living is something that takes time and research. However, once you find the right fit for you, it is more cost effective than the alternative. Vinegar is one the non-toxic options for household green cleaning. Baking soda and vinegar aren’t just great for science fair projects, but they can be used to clean drains, bathtubs, sinks, and toilets. Vinegar mixed with water is also great for cleaning mirrors and wood floors! However, the effectiveness of these home remedies are often limited. 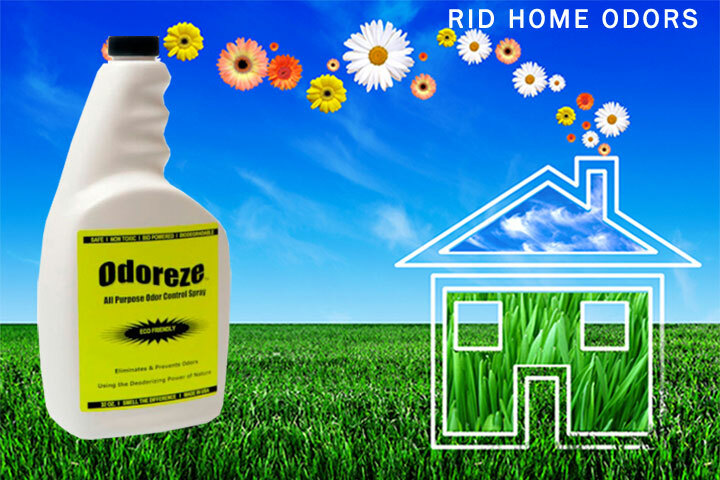 If you have a really tough cleaning problem, use a professional product like ODOREZE™ Natural Multi-Purpose Green Cleaner & Deodorizer to get the job done safely. It’s made from 100% plant based ingredients and is non-hazardous, eco-friendly and effective. Since it’s available in a concentrated form, it will also save you storage space. Instead of investing in expensive candles, scented oils, or wall plug-ins that often can give off harsh chemicals to keep your home smelling delicious, opt for an easier and safer alternative. Products that work by masking odors with chemical fragrances can be harmful to you and the planet. If it is stench you are worried about, try natural odor reducing products like SMELLEZE™ Reusable Home Odor Remover Pouches. They are great for making your house smelling consistently clean and fresh. They not only get rid of the odor but also the harmful odor causing chemicals. They are also built to last for years so they are very cost effective as well as eco-smart and safe. When it comes to things such as pest control, many home owners are ambivalent about contacting an exterminator or using products that are harmful to their environment around them. However, living with unwanted pests can also prove to be less than ideal. Try using a household remedy to rid your home of ants such as boiling water and lemon juice. The heat from the water and the acidity of the lemons will leave your pathways ant free. Nina Hiatt has worked helping clients find balance and beauty in their personal space through landscape and interior design. She specializes in helping young designers build their portfolios and start their own business. In her free time, Nina enjoys anything to do with gardening, from pest control to original recipes directly from your own garden. do you have any sugestion for ridding the smell from shoes? I would recommend using Smelleze® Reusable Shoe Smell Deodorizer Pouches to eliminate odor from your shoes. For a breath of fresh air, simply place 1 Smelleze® pouch in each shoe and allow it to work for a few days and smell the difference.